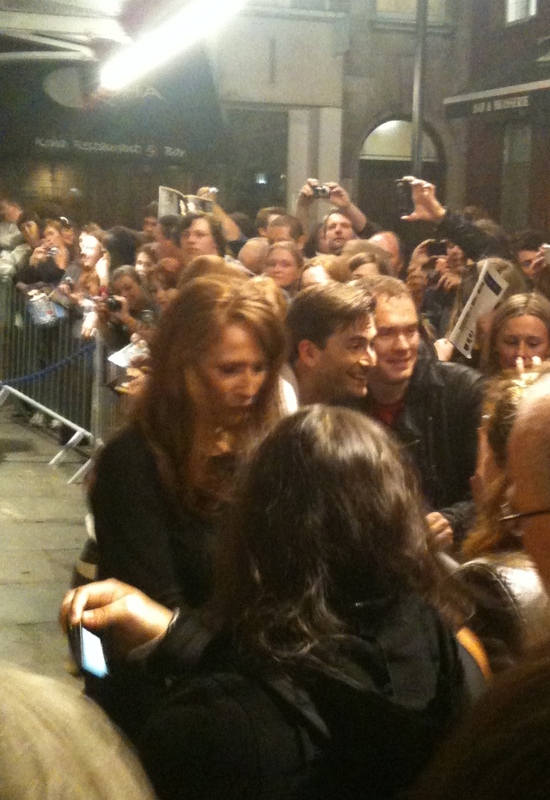 "We're going to see David Tennant and Catherine Tate in Much Ado About Nothing", Haley said to me in November 2010. "We've been here before", I thought. A couple of years ago we joined the RSC so we could buy advance tickets for the London run of Hamlet (starring David Tennant and Patrick Stewart). I say "we" but Haley was far more keen on it than me. I wonder why. If you follow the exploits of David Tennant as closely as our household, you will remember that he suffered a back injury and almost the entire run was performed by the understudy. 7 months later we rock up to Wyndham's theatre, expecting there to be some disaster and one of the 2 headline actors would be incapacitated. We have a long history of not seeing famous people in plays - Thoroughly Modern Millie (without Amanda Holden), Hairspray (devoid of Michael Ball) and Hamlet (you know all about that). For weeks Haley had been getting a little agitated at the prospect of a Tennant-less Much Ado. No announcement was made when our tickets were snapped by the usherette; the programme seller showed no sign of nervous twitch. The lights went down, the music started up and Catherine Tate (in the role of Beatrice) was found lying on a sun-lounger. Phew. One down, one to go. Within moments David Tennant (in the role of Benedick) appeared on stage, and finally I could relax and enjoy the show. Tennant made a most unusual entrance, driving a union flag draped golf cart onto the stage. There was almost a standing ovation when he appeared. The man next to me nearly exploded from the excitement - he was several sheets to the wind already, a middle-aged man with his current female "best-friend", who reacted in an ostentatiously forced way to everything on stage. Tut, Londoners. Tennant and Tate were in the roles of Beatrice and Benedick, who rail against the state of marriage to anyone who will listen, are inventively verbose, and cannot stand each other (because they are far too alike). I was interested to see if their chemistry would be similar to that they shared in Doctor Who, where they were chase and platonic. Their transition from people who claim to dispise each other to being the loves of each others lives is entirely believable. Beatrice has a line about her lending Benedick her heart - "a double heart for his single one" - Who knew Shakespeare was a fan of Doctor Who? Haley and I shared a knowing look at that point, fortunately it went over the head of the expressive queen next to us. I'm always slightly uncomfortable with Tennant speaking in his natural accent. Mostly because he does an "english" accent so immaculately that his Scottish accent sounds fake. He acted his socks off, with an amazing amount of energy, including wearing a mini-skirt, bubble wig and pig nose for the "masked ball", and dancing very "enthusiastically". The part of Beatrice also suited Tate, more than I had perhaps given her credit for. There were moments where she slipped into some of her personas, or tailored versions of them, which could easily have been cringey, but instead fitted perfectly with the character who was "born to speak all mirth and no matter". Her Frankie Howerd impression was nearly as good as David Walliams. She looked gorgeous in her wedding outfit too. There is one very tender moment where she lets down Don Pedro (Adam James) on his offer of marriage, which was a little gem of acting. There is a wonderfully slapstick scene where first Benedick and then Beatrice overhear characters they respect talking about how much the other secretly admires and loves them. Tennant gradually ends up covering himself with about a gallon of white paint and Tate is unwittingly hoisted 30" into the air. Haley did an audible sigh when Tennant delivered his "Love me!" soliloquy with white hand-print on his face, and messy, painty hair. He also had tight, cut-off jeans shorts. I swear Haley was dribbling by the end of that scene. The rest of the cast had a herculean task to match these to giants, but also did very well. Dogberry and The Watch are traditionally the slap-stick, "mechanical" roles but their performances were sadly diminished purely because of the high-energy Doctor-Donna performances. They were still funny and enjoyable, and there was a very sweet old man (Nicholas Lumley) in the watch who reminded me of my dad trying to speak to spanish in a deliberately RP voice. There was also our Barry (Mike Grady) from Last of the Summer Wine, who was conspicuously recognizable but who had hardly any stage time. Hero (Sarah MacRae) and Claudio (Tom Bateman) were everything you would expect from the lesser Shakespearian romantic leads, good looking but one dimensional. Live guitar music by Enzo Squillino Junior, who also played 2 minor roles, was excellent. It was truly the funniest, most vivid performance of Much Ado I will ever see. The audience was a menagerie of applause when the curtain came down, calling the cast back on to the stage 4 or 5 times, with only the elderly and infirm failing to give a riotous, and well deserved standing ovation. We elected to carry on the jolly mood we felt after the show, and visit a local pub for a quick drink. We wandered past the stage door, where I managed cajole Haley into waiting to see the cast ("they'll never come out"). Within 3 minutes Tennant and Tate burst through the doors and despite several terse A4 posters on the wall saying they wouldn't, they enthusiastically began signing programmes, having photos taken, and chatting to the rapidly swelling crowd. Haley refused to go too near because she was "embarrassed" and then spent an hour moping because the David Tennant didn't look past the 100-odd people in the crowd to share a magical moment with her, where their eyes would meet and he would fall hopelessly, madly, and deeply in love with her but recognise the impossibility of the situation, give her a loving but tragic smile then quickly look away with a tear in his eye. See it if you can. I will use the word. It was awesome.